A fundamentally new approach to real-time strategy games! We transfer the mechanics of genre from the virtual world into the real world, on the real robots. Real Warbots is a strategy game for two or more players. Game mechanics is the same as computer real-time strategy games. As usual, players will collect resources, defend the base and eliminate the enemies. However, the game is not on the computer screen, but in the real world with the participation of real robots. Moreover, as there are robots, the control will be also different from the standard “clicking and dragging”. It is a seemingly well-known set of actions as in all RTS games; however, these are robots, and nobody is preventing players from racing with obstacles, hunting the cats, passing beer bottles or anything else that may spring into your mind. The player must make an algorithm of robot actions from simple blocks like shoot, move, turn etc. After that, the algorithm is wirelessly sent to the robot who begins to carry out his task. If the situation changes, the player makes a new algorithm, sends it to the robot and it starts acting in a new way. The player is free to make algorithms of any difficulty. Someone will make them small, of several clicks, and will be sending new tasks to the robot all the time. Another player will spend some time before the game and make a big algorithm from maybe thousands of commands. Which approach is right for you will show only practice and player experience. Everything that the robots see by their sensors is displayed on the screen on the player’s map. Obstacles are shown as simple lines and help to understand where the robot can’t go. 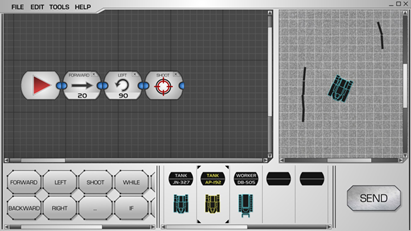 Other robots or resources are shown with the special icons. It helps the player to understand the distance between robots and their surroundings even if he can’t see it by his eyes. Every robot has its own identification number given to him “at the factory” that will never be changed. That means every robot will be unique and have its own name. The number of each robot will be placed in the general base and all its victories on official competitions will be written in the hall of fame of Real WarBots. Robots get experience points which can be spent on improving the various characteristics: hit points, speed, etc. or for the purchase of various perks. Dieser Eintrag wurde veröffentlicht in Crowdfunding, Fun, General und verschlagwortet mit Robot Game, RTS von Sebastian Trella. Permanenter Link zum Eintrag.